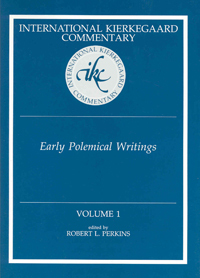 This collection is the first focused effort to bring modern research techniques to bear on Kierkegaard’s earliest polemical writings and literary efforts as gatheres in the first volume of Kierkegaard’s Writings under the title Early Polemical Writings. Some of these pieces—the speech at the student union, “Our Journalistic Literature,” and the rather strident, though silly, play, “The Battle between the Old and the New Soap-Cellars”—were not published during Kierkegaard’s lifetime. That the analytic capacities and philosophic sophistication of the mature Kierkegaard are not present in these early pieces comes, of course, as no surprise. Rather, these first writings show the young student already at work on many of the issues that occupied him throughout his short life and indicate that he already was experimenting with projected self-images and writing styles. Some of Kierkegaard’s critical standpoints so early enunciated later remain relatively unchanged, perhaps with little credit to Kierkegaard: For example, his conventional views of women and his suspicion of the political process. His critique of idealist philosophy is already wuite apparent. The religious is almost entirely absent, except for a contrast between “a purely human” and the “true Christian” conviction (EPW 76-77). Kierkegaard’s capacity to transmute his considerable learning into fresh and original literary works is also apparent even in the unfinished, unpolished, and incoherent play. This collection of literary efforts in Kierkegaard’s writings is in every way a series of voyages of self-discovery, laden with significance for the later production.